Ísókrates (436 – 338 f.Kr.) var forngrískur mælskufræðingur og einn af attísku ræðumönnunum tíu. Hann rak skóla í Aþenu. Á sínum tíma var hann ef til vill einn áhrifamesti mælskufræðingur Grikklands. 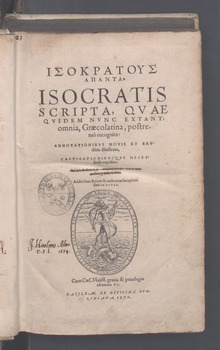 Isocrates, Isocrates I (þýð.) David C. Mirhady og Yun Lee Too (Austin: University of Texas Press, 2000). Isocrates, Isocrates II Terry L. Papillon (þýð.) (Austin: University of Texas Press, 2004). Isocrates, Isocrates volume 1 George Norlin (þýð.) (Cambridge, Mass: Harvard University Press, 1928). Isocrates, Isocrates volume 2 George Norlin (þýð.) (Cambridge, Mass: Harvard University Press, 1929). Isocrates, Isocrates volume 3 La Rue Van Hook (þýð.) (Cambridge, Mass: Harvard University Press, 1945). Fólk fætt árið 436 f.Kr. Fólk dáið árið 338 f.Kr. Þessari síðu var síðast breytt 22. nóvember 2017, klukkan 16:28.